You take it pretty much for granted, the umbrella. It falls out of the coat closet whenever you don’t need it and gets hopelessly tangled up with its cousins when you’re trying to drag it out so you can get to the car in a downpour. And the one you keep in the car? You know, the one you started to toss in the trash because its spokes are bent and it doesn’t stay open but then you thought well, it would be ok to keep it in the car, what the heck. Yeh, that one…….it’s stuck for good under the back seat, so forget about it. The umbrella offers protection from the weather, be it too wet or too hot. Unless you’re Mary Poppins and then it’s a handy means of transportation. I wondered when my fellow humans came up with this very human tool. Umbrellas appear in the art and artifacts of civilizations such as Assyria, Greece, and China going back about four thousand years. 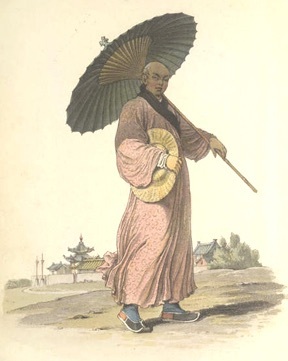 They were mainly sunshades until the Chinese created an oiled, shellacked paper parasol that kept the rain off. Off the emperor, not you or me. It was strictly a high society accessory. 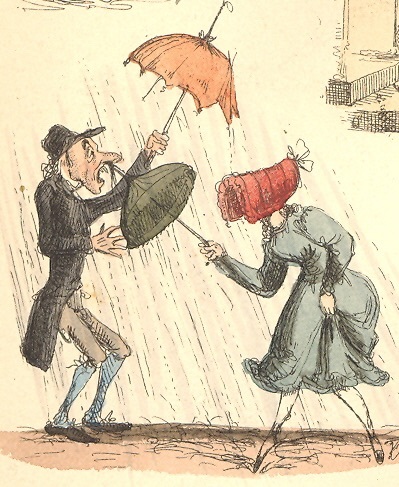 The waterproof bumbershoot became more necessity than accessory in the wet, rainy climate of the British Isles. What’s more British than a man and his tightly furled umbrella? He kept it to himself for some time, racing gallantly to the rescue of helpless females caught in the rain, until women were permitted at last to carry their own, as long as theirs were dainty and pretty, not big and useful. Speaking of useful, once women assumed control of the umbrella, they found it could make a very handy weapon, should the need arise. Keep your distance, sir! Umbrellas now come in all shapes (mostly still round, however) and sizes (the little decoration on your fancy drink, your huge golf umbrella) made from all kinds of materials. You can see through the clear plastic ones, such as the kind Queen Elizabeth II carries. Or you can find ones made of bullet-proof Kevlar, which can be used as shields. I mean, that’s real protection. You can fold them up tiny to fit in your pocket when you travel, or erect a special giant size one to create your own shady spot on a scorching beach. You can shape your environment, no matter where you are. My grandmother always said it was unlucky to open an umbrella in the house. I’ll bet it would have been, if we had, say, knocked over one of her lamps with one. For the record, she also said you would go blind if you wore galoshes in the house. Just sayin’.